This summer, when road trip season is in full-swing, Canadians will be looking forward to the arrival of the all-new 2018 Volkswagen Atlas. Engineered primarily for the North American market, the all-new Atlas is a seven-passenger SUV that boasts an incredible suite of technology upgrades, sophisticated styling accents on the interior and exterior, and the versatility required to accommodate both work and play. The 2018 Volkswagen Atlas will be offered in both FWD and AWD models. The FWD models will feature a turbocharged 2.0-litre inline-four engine boasting 238 horsepower, while the AWD models will be powered by a 3.6-litre V6 engine that distributes 280 horsepower and an expected 266 lb.-ft. of torque. Both engines will be matched with eight-speed automatic transmission with manual mode available. For those who crave the idea of taking power to the next level, the Atlas’ 4MOTION All-Wheel Drive does just that, allowing you to tackle even the toughest off-road surface conditions. From sandy beaches to rocky dirt paths, the new 2018 Volkswagen Atlas was built for all of life’s unexpected adventures. Up front, drivers can explore the open road with confidence, thanks to a series of advanced safety upgrades that come standard on the new Atlas. Blind-spot detection systems alert the driver to any traffic approaching from the sides, while a wide-lens rearview camera gives you another set of eyes at the back, so yours never leave the road ahead. Packed with collision-avoidance technologies, a standard automatic post-collision braking system and additional safety features like forward-collision warning, automatic emergency braking, a blind-spot warning system with rear cross-traffic alert, and a lane-departure warning system with lane-keeping assist, you can enjoy the spontaneity the Volkswagen Atlas provides and rest assured knowing you are protected at all times. The biggest and best feature of the new 2018 Volkswagen Atlas is its high-quality styling. At first glance, drivers can pick any one of the eight new modern paint colours available, from shiny Reflex Silver Metallic to bold Tourmaline Blue. The 2018 Volkswagen Atlas is significantly taller and wider than previous vehicles, making it the largest Volkswagen vehicle available to date. 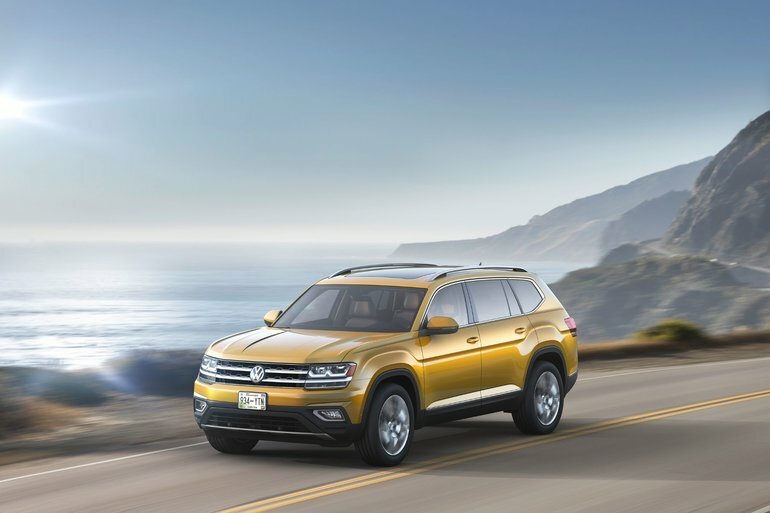 Attractive exterior design elements follow traditional Volkswagen styling cues for a well-rounded and balanced SUV. The new Atlas will feature LED headlamps and taillamps, allowing for greater visibility day or day. The most significant design changes can be found on the inside of the Atlas. For starters, the second-row seats are split 60/40 and the third row seats are split 50/50, allowing for plenty of cargo space. The second-row seat can also slide back to maximize legroom when the third-row seat is not in use. You’ll never hear your passengers complain about being placed in the back ever again! The new Atlas has third-row seating designed to fit two adults comfortably. To keep things interesting on those longer trips, a new very large colour touch screen has been added to the Atlas’ infotainment system. Drivers can always stay connected, while enjoying hands-free communication technologies. Volkswagen has confirmed that a well-rounded list of optional features will be available on the 2018 Volkswagen Atlas, including a heated steering wheel, perforated leather upholstery, a panoramic glass sunroof over the first 2 rows of seats, a 12-speaker Fender premium sound system, and a Car-Net App-Connect infotainment system with navigation. Interested in learning more about the all-new 2018 Volkswagen Atlas? Contact Crosby Volkswagen today at (866) 403-2834 for more information. Be sure to stay on our newsletter list or sign up for it HERE, to recieve your invitation or our Atlas Launch, this spring.